If any artist could be said to represent a Seattle “sound,” it would be the multifaceted, kaleidoscope-eyed West Seattle resident Amy Denio. A multi-instrumentalist, vocalist, producer, and composer, Denio will premiere her newest work, “Truth is Up for Grabs”—an eight-piece song cycle for extended chamber ensemble—November 11 at the Chapel Performance Space, with Mike Jauregui conducting. “The music is inspired by current events, but it is also about beautiful things in the world right now, like international collaboration in music,” says Denio. While the song cycle does address complex themes, such as contemporary military-based economies, and uses dramatic sources including a poem by the Spanish poet Pablo Neruda, “Songs for the Mothers of Slain Militiamen,” Denio insists on finding a positive inspiration of present-day music as an international language. By crossing borders both political and musical, Denio, a Seattle Hall Jazz of Famer, has found the universal in music on over six continents. Her career has ranged from vocal studies in Bombay to a worldwide New Year’s Eve broadcast from Naples with her band Quintetto alla Busara. 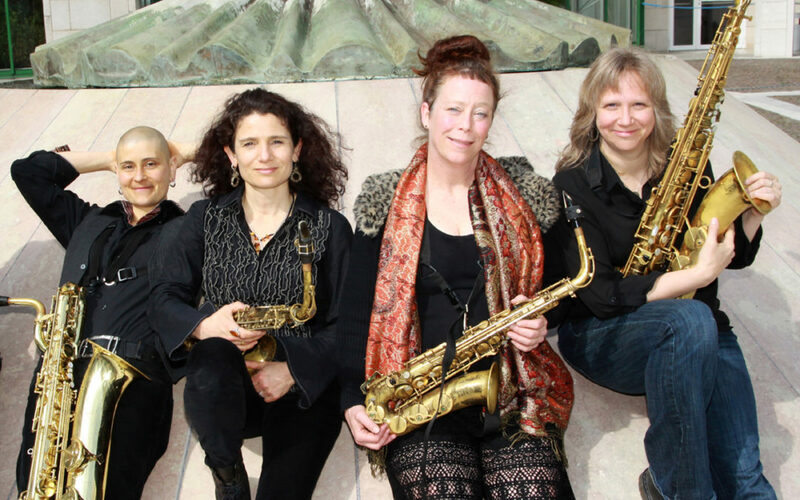 As a multi-instrumentalist and producer, she has founded bands including the all-women sax quartet the Tiptons, and now has over 50 recordings to her name, many on her label, Spoot Music. As a composer, she has been commissioned by everyone from the Italian National Radio to the Berkeley Symphony, and written largescale works for film and dance companies. Her last piece for chamber orchestra, a song cycle titled “Non Lo So, Polo,” inspired by the writings of Italo Calvino, premiered in Seattle in 1996 and led to an eight-stop tour of Austria. Now revisiting the orchestral canvas, she cites musical influences such as a childhood favorite, the Stan Kenton orchestra, to her expansion of the traditional string ensemble with a brass section, electric guitar, and percussion. “I wanted to create slightly different sounds and go on my own path,” says Denio. These include Seattle session standout Geoff Harper (bass), Industrial Revelation’s Evan Flory-Barnes (bass), and Cornish Chair of Music James Falzone (clarinet). Likewise, conductor Mike Jauregui is another multi-faceted artist enriching the Seattle scene. A composer, educator, and instrumentalist, he can be found playing trombone in orchestras and big bands, leading his rock band Manifide on guitar and vocals, or conducting youth symphonies. “He’s excellent at conducting with individual sounds from each instrument,” Denio says.